3M™ Duct Tapes are built to stick. Whether your surface is smooth and refined or rough and rugged; whether you job is one hour or one year, we have the inventory of dependable 3M™ tapes to help you get the job done. Specific tapes may be used in outdoor applications offering clean removal for up to 6-months outdoors. Applications include bundling, moisture proofing, sealing, splicing, reinforcing and hanging poly drapes. Built to stick, whether the surface is smooth or rugged, 3M™ Duct tapes get the job done. 3M 2929 5.5 mil Silver General use grade, conformable cloth duct tape. 3M 2979 7.0 mil Silver General use grade, conformable cloth duct tape. 3M 3900 7.7 mil Various Industrial-strength tape with multiple colors for identification. 3M 3903 6.5 mil Various General purpose duct tape with embossed vinyl backing. 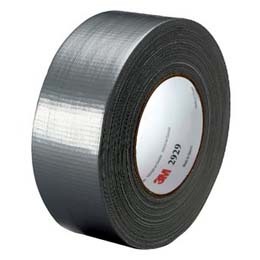 3M 3939 9.0 mil Silver Industrial-strength duct tape has high tensile strength and adhesion. 3M 6969 10.7 mil Various Industrial strength, easy tear, and abrasion resistant. 3M 8979 12.1 mil Various Allows for both permanent and temporary indoor and outdoor applications. 3M 8979N 12.1 mil Various Allows for both permanent and temporary indoor and outdoor applications. UV resistant up to one year.